For the vast majority of users, such a kit as the Dominator Platinum RGB would go largely wasted, with most of the performance being imperceptible to anything but the most extreme of use cases. However, content creators, especially those handling 4K or 8K footage, or competitive gamers demanding 240Hz from their systems, where having the best possible components can make all the difference. What can be appreciated by all, however, is the beauty of the RGB lighting. Corsair went to great effort, alongside Primax, to design and develop their new Capellix LEDs that offer brighter, more efficient lighting which take up less real estate. Due to this, the lighting is much more vibrant and vivid than on previous Corsair modules. We also found it matches the hues put out by their LL120 fans and H100i Platinum pump header perfectly, which goes a long way to making a build look as uniform and professional as possible. While we mention that the performance would be “wasted”, that isn’t necessarily true, it just wouldn’t be noticed by most users, with a kit of 2133MHz at JEDEC standards sufficing for a lot of people, though, do not let it be said that this won’t improve performance. This kit has a lot of potential in systems that are running at their maximum where bottlenecks can pop up all over the place. Having said that, our graphs don’t lie and show this 3200MHz kit beating out a very competitive 3400MHz kit from G.SKILL at almost every turn, no mean feat at all. We were rather excited to see what the Dominator Platinum RGB would be capable of when overclocked, hoping to push these things to their absolute limit, and with Corsair’s backing, we went ahead and tried, but unfortunately there doesn’t seem to be a whole lot of headroom left. 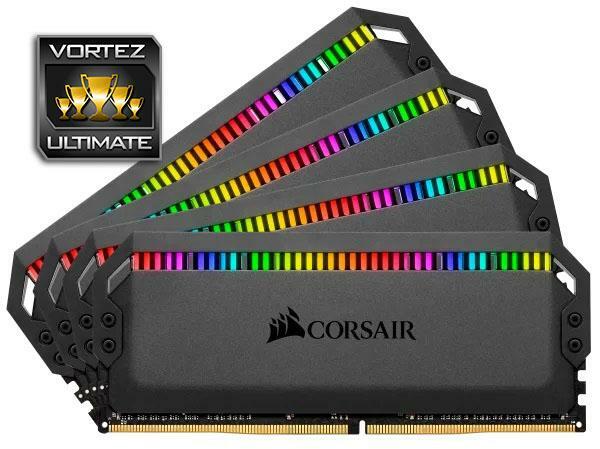 Though, on the other hand, it does appear Corsair has done a lot of the hard work for us, via their screening process, in providing a kit that is 100% stable at these incredibly low timings of 14-14-14-34. Finally, the price. This shocked us a little at first, with a £499 asking price, which is almost twice the going rate of kits at 3200MHz, even with RGB lighting and large heat spreaders, but you’re essentially paying for the intensive screening process that such a tight timing package demands. Most other RAM kits at this capacity and speed are running around the 16 to 18 mark. The bottom line is, in the world of PC enthusiast hardware, the law of diminishing returns says you’re going to pay through the teeth for the best hardware possible, and the Dominator Platinum RGB is no different, but if you want the best, this is almost certainly it.